← Lourdes France, a place of pilgrimage or commercial enterprise? Somerzest Festival – a Celebration of regional excellence + more. Having had to abort my first attempt at going to the Somerzest Festival (I got the times wrong!) I went along on Saturday 28 August, accompanied by my sons aged 10 and 6, with a rough idea of what to expect: a few home grown trade stalls selling a hotchpotch of odds and sods and me climbing the walls because my two children would far rather be climbing trees! How wrong I was – on both counts! At the entrance was the opportunity to ‘throw’ you own pot then just inside the foyer was (in my humble opinion) one of the best bread producers in the country, Evershot Bakery and opposite was Bridfish Smokery. So that was lunch sorted! We were guided upstairs to the area that is usually occupied by excited or relaxed theatre goers, but this time it was alive with the colour, sounds and smells of an innumerable assortment of stalls. The first sight to meet my eyes was Radford’s Fine Fudge and having already been won over by their excellent fudge, I readily bought two bags; one chocolate flavoured and one clotted cream. Next to them was Wishing Well Cupcakes with the most delightfully decorated cakes that looked too good to eat. Four for £1. That was pudding sorted. 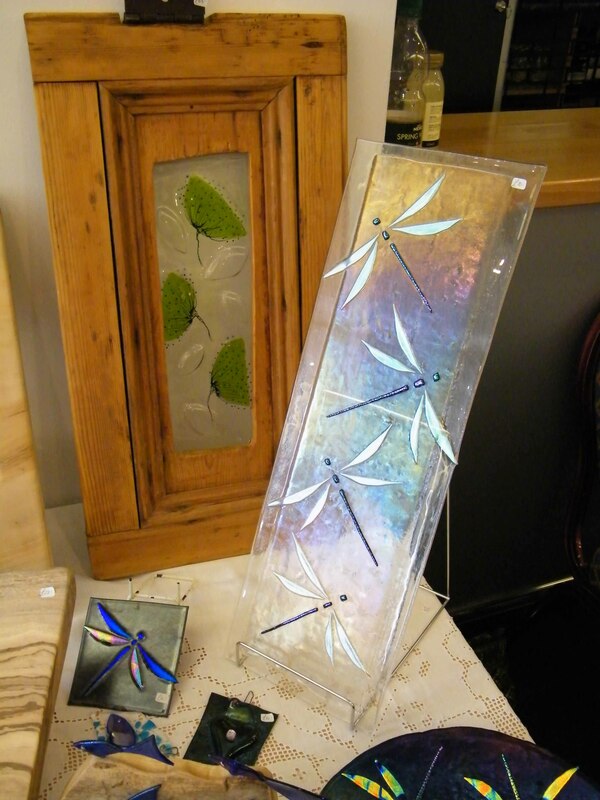 Every stall had something to tempt: Karina Foster with her metalwork and jewellery; Wendy Dunt Textiles; Ally Kay Paintings; Philip Brown Lighting; the list goes on. The three of us walked from stall to stall, eyeing up the items we wanted to buy. Occasionally a helpful organiser appeared to remind us about the children’s activities downstairs – face painting and the like. We had to stop at the Bakers of Haselbury Pluycknett stall; my eldest son is a cheese fiend so the sample plate was soon decimated! But it was a delicious cheese and they were interested to hear why I have always bought organic dairy products, they told me they never manage to speak to the customers, only sales teams. And that’s when my already improved opinion of the event was upgraded. Opposite the Bakers’ stall was Somerset Orchards selling their single variety Kingston Black and Browns cider apple juice. We all tried a sample and liked what we tasted, so two bottles were bought; then out of the blue the lady offered to take my eldest off my hands if he was willing to help her on the stand! My suspicions were aroused; this was a little odd! Why would anyone want to take my eldest son (love him as I do and only as a mother can) in exchange for nothing – I was willing to pay her! The deal was struck: he helped on the stall; I was able to look around the rest of the stands in relative peace with my youngest. Everyone was very happy! So only 50% encumbered, I continued on my foray. The stalls continued to impress: Karen Dupe Prints; Sew Unique Felt-maker; Pippa Hill Ceramics. Then I met Amanda Durston from Cheddar. Amanda is a self taught glass artist. Self taught possibly, an obvious gift for exquisite glass artwork definitely. We chatted for a few minutes about how she came to produce such delicate but sturdy beauty in both glass and wood forms and the love and enjoyment she finds in her work was easily detected in both her conversation and actions. But my parking ticket had run out of time and my wallet money and whilst the offer from Somerset Orchards to keep my son for the rest of the day was very tempting, we made sure we had our various bags of goodies and left the Festival. But I ensured I put a note in my diary for the next event: Friday and Saturday 3/4 December. So if you missed the Somerzest Festival this time round, don’t miss the opportunity again. Somerzest, a chance to buy regional excellence. This entry was posted in Festivals & Fairs and tagged crafts, drink, fair, Festival, food, Octagon, Somerzest, Yeovil. Bookmark the permalink.